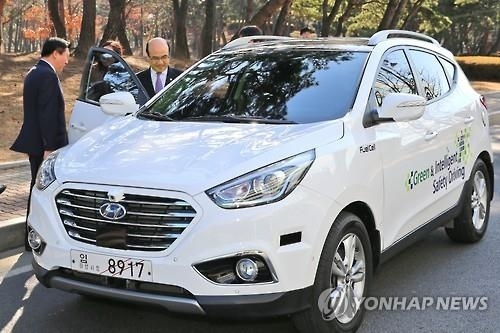 SEOUL, Sept. 12 (Yonhap) -- Hyundai Motor Co., South Korea's leading automaker, said Monday that it has signed a deal with a local government to supply its fuel cell electric vehicles (FCEVs) as part of efforts to foster the hydrogen car sector here. Under the deal, the automaker will deliver 10 units of the Hyundai Tucson FCEV to the city of Ulsan where they will be run as cabs. Hyundai Motor also signed a separate deal to provide its FCEVs for a car-sharing program in Gwangju, a southern city, it said. An FCEV is a type of hybrid vehicle that uses a fuel cell and a battery to power an electric motor instead of an engine. Because its fuel cell requires oxygen, the car purifies air for oxygen and thus gathers fine dust in the process. Hyundai currently produces the only FCEV in South Korea, and its Tucson became the first mass produced fuel cell car in the world in 2013. But the high prices of the eco-friendly car and a lack of fuel stations have been a serious drag on the country's attempt, as only 78 hydrogen fuel cars have been sold to the local governments and public firms. Earlier the South Korean government launched a consultative body of representatives from the public and private sectors in order to steer the hydrogen car industry to a leading growth engine of Asia's fourth-largest economy. It also announced a plan to export 14,000 fuel cell cars and set up 100 hydrogen fuel stations by 2020 as part of its efforts to transform the fossil-fuel dependent economy into a renewable energy-led one.